Chrichton's World: Review Hunter Killer (2018): Actually quite entertaining! Gerard Butler has a real talent for picking out the worst titles to be in. Most of the time he is able to make it entertaining despite the awfulness. However even he can't save films like Geostorm amd Gods of Egypt. Fortunately I can report to you that Hunter Killer actually is a very decent title. But if you were expecting something in the line of let's say The Hunt for the Red October I will have to disappoint you. It probably was trying to get a similar vibe but without the Cold War it simply loses significant impact. Although even without it that film is full of tension and thrilling moments. Hunter Killer does have some tense and surprising moments but more coming from a direction you wouldn't expect. Which is good. Actually now I think about it. 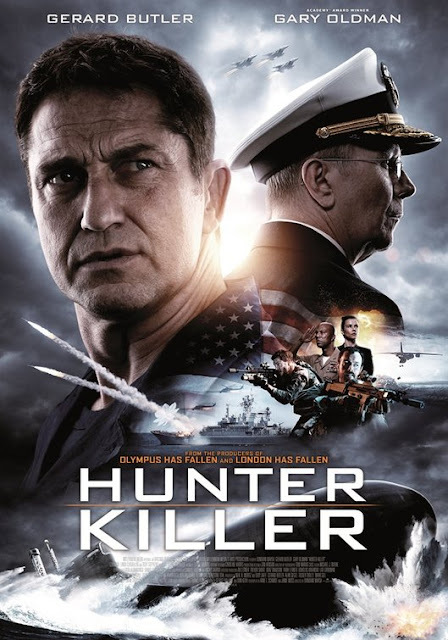 Hunter Killer does try real hard to avoid the trappings of films like these and I must say does succeed in that even if it comes at the cost of credibility. Most of the events are far fetched. And it is asked of you to go with it. So you are required to shut off your brain and follow the fantasy. Most of the performances are adequate. Butler is born for the role. He truly has the presence of someone I would gladly take orders from. Toby Stephens though might be the most surprising as he plays a veteran soldier in the same vein as Willem Dafoe in Platoon with one difference. He loves doing his job. He and his team mates are ordered to do an almost impossible task. And Stephens barely is hardly worried. Almost disappointed that the odds are against them enough. Deep down Hunter Killer is a simple B action flick with some intrigue. If you are into those films you will have a grand time.